I love salads but sometimes when its cold I make this warm chickpea salad as its perfect eaten hot or cold. With middle Eastern flavours it goes really well with a meze of pitta bread, hummus, Baba Ganoush to make the perfect lunch. A warm spiced chickpea salad with lovely Moroccan flavours. 4 sprigs fresh coriander finely chopped. In a pan add the olive oil and saute the onions until translucent. To the onions add the the chick peas, peppers and warm through. 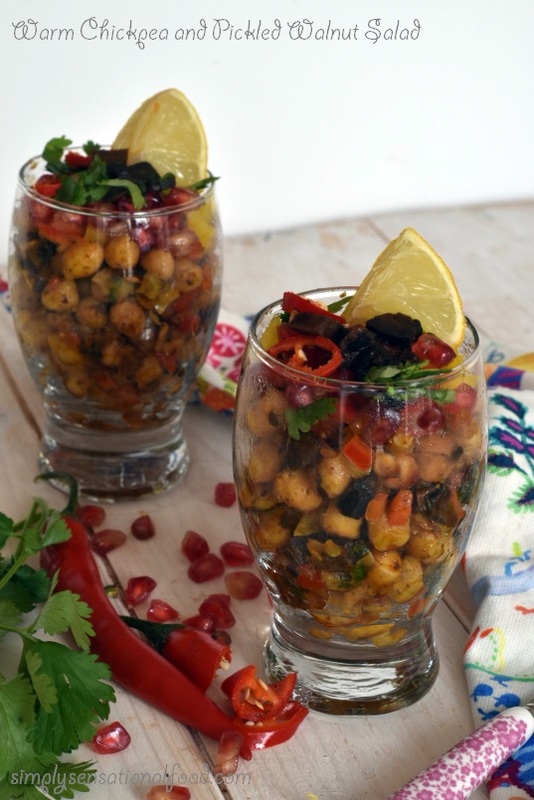 Transfer the chickpea mixture to a bowl and add two thirds of the pomegranate and pickled walnuts and the chopped coriander. Transfer the salad to serving bowl and garnish with remaining pomegranate and chopped coriander. Now this sounds like an interesting salad, I like that it is warm, that would make for a good salad to have in the colder weather! This warm chick pea salad looks delicious! I think I want to make it to take with me for work lunches! This salad looks so amazing! I've always liked chick peas. I'll have to make this one day for sure. I've been really wanting to incorporate chickpeas into my diet and I think this would help. Thanks for the recipe! What has caught my attention is pickled walnut. Never tasted it, what is used to pickle walnuts. A warm salad is most welcoming during the cold season, especially when its so flavorful. I think this will be great for our home. I can make large batches so I can either heat it or eat it cold. That Warm Chick Pea Salad with Pickled Walnuts sounds really delicious! Quite interesting recipe. Sounds like unique one. I did not come across it so far. I will plan to try it . This salad looks so yummy. I am going to try it out.Pickled walnut is something new. Never tasted it. Will have to see where to get it from. Oh my what a lovely salad. I never heard of pickled walnut, is that something new? Also, would the green capsicum not make the salad bitter? Just curious as I tend not to use the green ones raw. That looks really delicious! 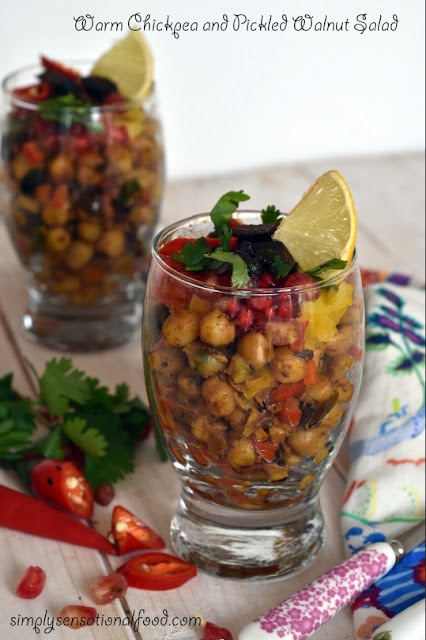 I love some chickpea recipes! Wow.. this looks like my kind of salad.. I prefer these to the usual vegetable salads as they are much tastier. How do you make pickled walnuts Nayna.. ? A warm salad sounds appealing to me today when its cold and wet. Love the idea of adding walnuts and pomegranates to it. And all those lovely spices!! It sounds just perfect. I love chick peas! This looks like a great salad to try, when I need my chick pea fix! I'm a chickpea person, so I have to thank you for sharing this wonderful recipe. Pinned! This looks so tasty!! I will definitely try this in this weekend. Thanks for sharing. Pickled walnuts, now I want to make this!! Salad sounds delish! Love every ingredient that has gone into making this yumm one ! Fresh ingredients and love the way it is served! I love chickpeas and this salad recipe sounds so delicious, with all the healthy and fresh ingredients!! I will love to love to munch it anytime!! I make chickpea salad often, but with a different dressing.I like the combination of lemon juice,sumac and red chilli. must try. I've never had this before but it looks really good! I'll have to give this recipe a try and see how we like it, thanks for sharing! Sounds delicious and those pickled walnuts have never intrigued.